They are an attractive boundary to a house or property. You can choose a plant to provide leaf colour or texture, attractive berries, edible fruit or evergreen foliage which will look great all year round. They can be used to deter unwanted guests from your property. Using plants such as holly, pyracantha or dog rose have thorns which will keep away trespassers. Hedges can be used as a wind or noise break. A substantial 5-6 foot hedge will dramatically reduce the amount of traffic noise. They are particularly useful in windy areas, especially if you don’t want something as intrusive as a fence. A hedge is a great home for wildlife especially nesting wildlife. Hedges provide a good background for a planting scheme and can also provide structure to a garden. When should I plant a hedge? Container grown hedging plants can be planted at any time of the year apart from when the ground is frozen or waterlogged. This type of plant will have been grown for a period of time in a pot and will have its own root structure contained within the pot. There will be minimum disruption of the roots in the planting process, therefore stressing the plant as little as possible. A pot grown plant is the most likely to take root successfully but is also the most expensive way to buy hedging. 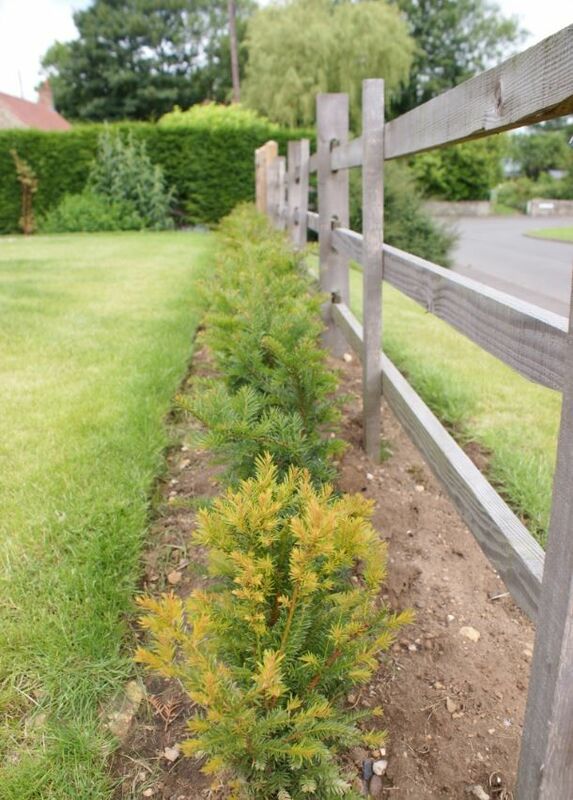 The best time of year however is early autumn for evergreen and semi evergreen hedging. This is because there is still enough warmth in the soil from the summer to encourage the roots to grow out but not too warm that there is risk of the plants drying out. Pot grown plants can be bought from nurseries, garden centres or even supermarkets. Bare-root hedging can be planted when the plants are dormant. This is usually during Autumn when the leaves have fallen, through Winter and until the buds begin to break in the Spring. Bare-root hedging is grown in a field and lifted (usually to order) with machinery. The plants will have a good root and some soil and are usually supplied bundled together in a bag. They are lifted from the field at this time of the year so the plant is stressed as little as possible and is more likely to take root when transplanted. Bare-root hedging plants are considerably cheaper to buy and are an ideal choice for large quantities that require planting. These plants can be bought direct from nurseries in large quantities or garden centres will sell smaller quantities. They can vary in size from a few centimetres tall to 4 or 5 foot tall. Root wrapped or root-balled plants are also available in the Autumn through to the Spring. This tends to be evergreen or semi evergreen plants. Evergreen plants do not have a dormant period, they have a period of slower growth and keep their leaves. They still need a good supply of water to survive and pulling them out of the ground will reduce the amount of roots and therefore the amount of water they can take up. By keeping a ball or root wrap around the roots, the amount of water available is increased, giving the plant a much better chance of survival. The amount of plants will depend on the overall quality of hedge you require. Smaller bare-rooted or pot grown plants will need to be planted closer together. For example a 30cm whip of Hawthorn or Beech will need to be planted 3 plants per metre in a single line, or if you want to create a thick hedge, 5 plants per metre in a staggered double row. If you are using larger pot grown or root-balled plants 3ft tall you can plant 18 inches to 2 feet apart. If you have a boundary line, it is a good idea to plant 3ft away from this so the plants have room to grow and will not overspill your area. If the area has a lot of weeds or grass, you can apply a weedkiller to the area before hand. A total weed killer containing Glyphosate will kill everything. It is best to have a clear site, as weeds will compete for water and light with the new hedging plants and you want to give them the best possible start. The ground needs to be dug over to a depth of a spade and 2-3ft wide. Organic matter can be incorporated to improve the quality of the soil. Organic farm manure is a perfect way of enriching the soil by adding vital humus and nutrients which are needed to establish a hedge. Fish, Blood and Bone is also a good addition and will promote strong root growth. Using garden string, create a line to work against so you are happy with where you are placing the plants. When planting container grown plants or bare rooted plants, dig a hole slightly larger than the root ball. Tease out the roots from the root ball to encourage them to grow out in the hole. The plant needs to be planted to the same depth as it was in the pot. Too high, the roots can dry out and too low the stem can begin to rot. Firm the soil around the plants, so the soil is in close contact with the roots. Once finished, the plants need to be watered in well. Use roughly one watering can per plant. Bare-rooted plants need to be planted as soon as possible so that the roots don’t dry out. Unwrap them and stand them in a bucket of water. Any roots that look damaged or dried up and dead can be cut off with a pair of pruning secateurs. Using a spade, create a hole or trench and place the plant to a depth to where the roots are flaring out from the stem. Firm the soil around the plant and water in well. A layer of mulch can be applied to the surface of the planting area. This will keep moisture in the soil, prevent weeds from growing and will eventually break down and provide added nutrients to the plant. For free technical advice then give us a call and ask for our Horticultural expert who will be happy to help!